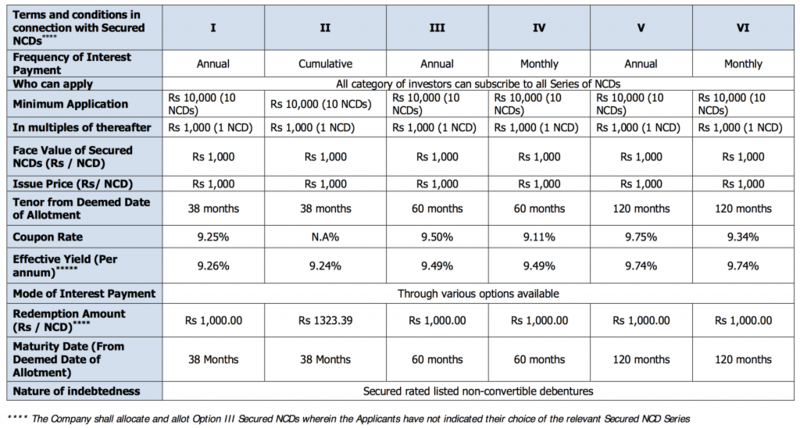 Public Issue of NCD of Mahindra Finance – upto 8.05% p.a. 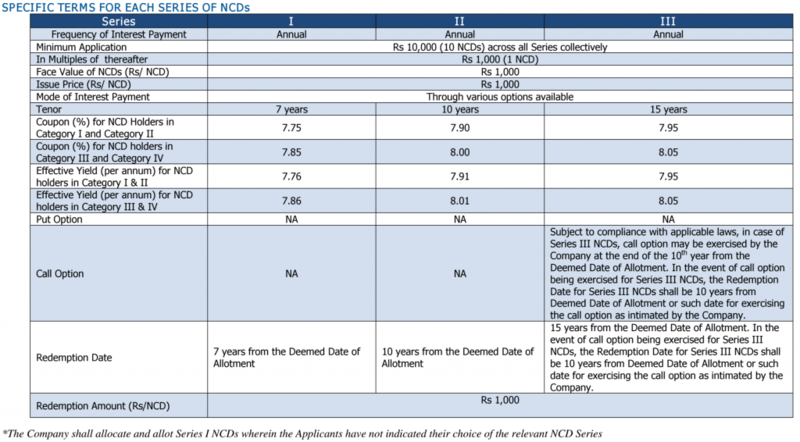 Public Issue of NCD of Muthoot Finance Ltd – upto 9.00% p.a. Secured NCDs for an amount of Rs. 1,950 Crores and Unsecured NCDs for an amount of Rs. 50 Crores. CPSE ETF was launched in order to facilitate GOI’s (Government of India) initiative to dis-invest some of its stake in selected CPSEs through the innovative ETF route. The ETF is based on Nifty CPSE index which includes 10 listed Central Public Sector Enterprises. CPSE ETF is a Rajiv Gandhi Equity Savings Scheme (RGESS) Qualified Scheme. Based on the success of CPSE ETF NFO, DIPAM is conducting further divestment of the underlying CPSEs which are constituents of the CPSE ETF and hence launching the second tranche of CPSE ETF. Avail upto 9.25% interest on your investment for a 7-year duration. Issue opens : 29-August-2016. Apply Early. First come first serve basis. The issue offers yields ranging from 9.05% to 9.25% depending up on the Category of Investor and the option applied for. Total Issue Size : Rs.10,000 Cr. Fixed deposits have always been regarded as a safe financial instrument by people since they ensure security, provide fixed returns and are comparatively risk-free. However, if one looks at the current tax slabs, fixed deposits may not be as profitable considering the amount of tax incurred on them. Hence, it is highly recommended to park your money in debt funds instead which are essentially a mix of corporate bonds, treasury bills, mutual funds, government securities etc. If you compare credit ratings of fixed deposits and debt funds, you’ll observe that there’s not much difference in the rankings. These are released by independent rating firms which include CRISIL, CARE, ICRA etc. While fixed deposits have a rating of AAA signifying very high capital safety, debt funds have a score of AA implying high degree of money security. Income received from fixed deposits is termed as interest whereas revenue earned from debt funds is called as dividend. Both of them are categorised differently in terms of taxation. For fixed deposits, tax liability is based on the individual’s present tax slab regardless of the duration of the FD. Debt funds on the other hand attract virtually zero taxation if held for more than 3 years. For the first year, tax liability for both the instruments is the same. But for fixed deposit investors, taxes need to be paid on interest accumulated every year. Therefore, debt funds are more tax-friendly as opposed to FDs. Moreover, individuals who have investment goals for 3 years or more must certainly opt for debt funds and take advantage of the taxation benefit. Fixed deposits have a set duration and usually offer low liquidity until the deposit period ends. Most debt funds have high liquidity if the minimum holding time has elapsed and conditional on lock-in period as stated. Although some banks let individuals break the FD in part, many of them will ask you to withdraw the entire amount in addition to paying a penalty. When it comes to debt funds, individuals can enjoy complete liquidity for their investments. Any amount of funds can be withdrawn at any point of time from the total debt fund value. A small sum in the form of exit load might be levied if money is taken out in less than a year.